(Bloomberg) -- Volkswagen Group has agreed to set aside at least $10 billion to resolve civil claims by the U.S. government and lawsuits by American car owners over diesel vehicles rigged to cheat pollution controls, a person with direct knowledge of the matter said. The parties reached the accord ahead of today's deadline set by a federal judge for the carmaker to say how it would fix the vehicles. 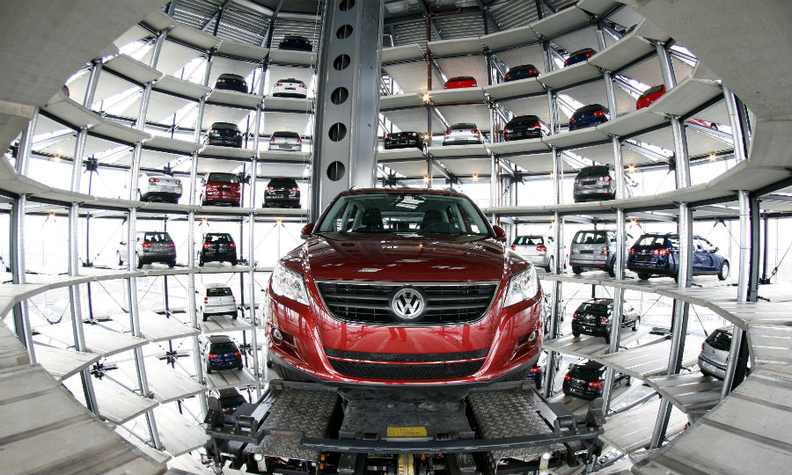 Volkswagen has been negotiating with U.S. environmental regulators on an acceptable solution. Judge Charles Breyer said that fixing the almost 600,000 vehicles or getting them off the road would be the first step to any settlement. It's unclear how much of the $10 billion will be paid out to car owners, said the person with knowledge of the settlement, or used to repair or buy back their vehicles. On Wednesday, Reuters reported that VW and U.S. officials have reached a framework deal under which the automaker would offer to buy back almost 500,000 diesel cars in the U.S. that used "cheat" software. Separately, Germany's Die Welt newspaper reported Wednesday that the deal to settle the case would involve VW paying each affected customer $5,000. But a person briefed on the matter said no decisions on how individual compensation will be awarded have been made. VW has fought to regain customers' trust after admitting in September that it rigged the exhaust systems of 11 million diesel-powered cars worldwide to pass official emissions tests. It has delayed releasing its 2015 earnings until it can better estimate of how much the scandal will cost and has postponed its shareholders meeting. VW spokesmen and the Justice Department declined to comment. The U.S. Justice Department's criminal investigation into VW continues, a source said, as do other probes abroad. Germany is looking into who at the company knew of the problem and how high up the deceit went in the corporate ranks. Volkswagen said Tuesday in a court filing it expected to reach a settlement and that it sees no need for a U.S. trial this summer. It isn't clear whether that $10 billion would resolve all of the U.S. civil claims against Volkswagen. That's also more than the 6.7 billion euros ($7.6 billion) that VW said it set aside in the third quarter of last year to pay for repairs and related costs worldwide. Still, the figure is well below the theoretical maximum penalty the carmaker could face. The alleged civil violations could cost Volkswagen more than $42 billion. Brandon Barnes, an analyst at Bloomberg Intelligence, estimated the cost of buying back all of the vehicles in the U.S. would cost about $9.4 billion. Volkswagen may also face financial penalties from the criminal probes. The company's total cost could reach about 30 billion euros, according to an estimate from Evercore ISI. VW reported net liquidity of 27.8 billion euros at the end of September, when it last announced earnings. Volkswagen admitted last year that it had manipulated diesel engines with a "defeat device" so emission controls switched on only during pollution tests. A plan to fix the 8.5 million non-compliant cars in Europe was largely approved in December but failed to meet U.S. requirements because of differing emissions standards.